In their preparation for the Good Humour Club exhibition at Shandy Hall (30 June to 30 September), Elinor Camille-Wood and Patrick Wildgust have solved one of the most long-standing of Sternean mysteries: when exactly were the first two volumes of Laurence Sterne‘s novel, The Life and Opinions of Tristram Shandy, Gentleman published? In The Shandean volume 4 (1992, pp. 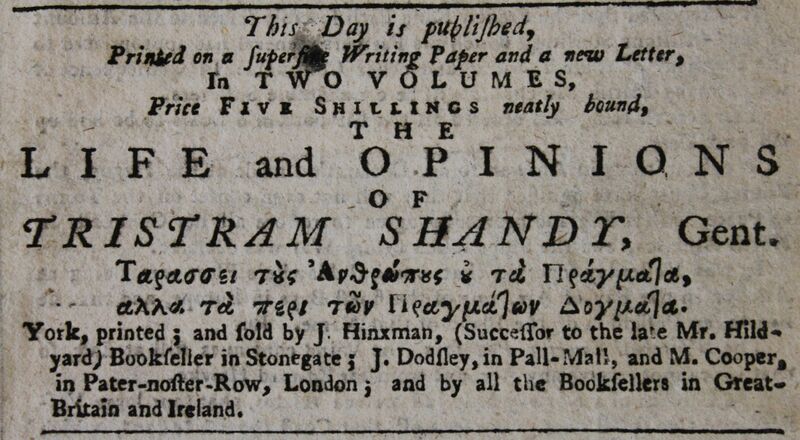 244-45) Anne Bandry published what was then believed to be the earliest advertisement for the first two volumes of Tristram Shandy. It had been printed in The London Chronicle for Thursday 20 December 1759. Not unnaturally efforts to discover the actual date focused on the succeeding days and weeks, but they proved to be of no avail. Elinor Camille-Wood and Patrick Wildgust’s discoveries show that these earlier efforts were misdirected. 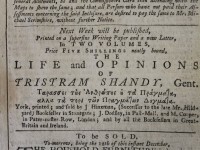 The earliest advertisement for the publication of the first two volumes of Tristram Shandy appeared in The York Courant for Tuesday 11 December 1759. 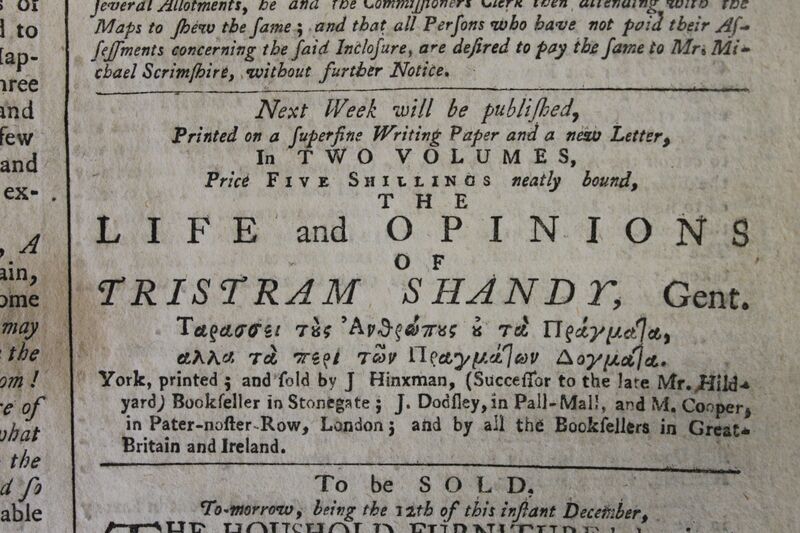 What is notable about this advertisement is the presence of the Greek epigraph from Epictetus, which also appears on the title-page of Sterne’s work, though it is not printed there in the same font. It is most unusual for Greek type to be used in an advertisement for a work of fiction in this way. That it was used in The York Courant suggests that Sterne was aiming his work at an audience of higher than average intelligence and linguistic competence. It may well be that the London partners in this venture took a rather more pragmatic view of the market for such texts and deliberately omitted what might have been seen as off-putting to many possible readers. The combination of Hinxman, Dodsley and Cooper is an interesting one, particularly as once the success of the York edition was secured, the subsequent London editions appeared over the name of Dodsley, with no reference to the other two. Hinxman’s predecessor, Mr. Hildyard, had collaborated with Cooper on a number of occasions, most notably on The case of Elijah and the widow of Zerephath, consider’d: A charity-sermon, preach’d on Good-Friday, April 17, 1747. In the Parish Church of St. Michael-Le-Belfrey, before the Right Honourable the Lord-Mayor, Aldermen, sheriffs and commoners of the city of York, at the annual collection for the support of two charity-schools. By Laurence Sterne, M.A. prebendary of York, which had as its publication details: York: Printed for J. Hildyard bookseller in Stonegate: and sold by Mess. Knapton, in St. Paul’s Church-Yard; Mess. Longman and Shewell, and M. Cooper, in Pater-noster-Row, London. Hildyard and Cooper had also worked together on two publications by Jaques Sterne. 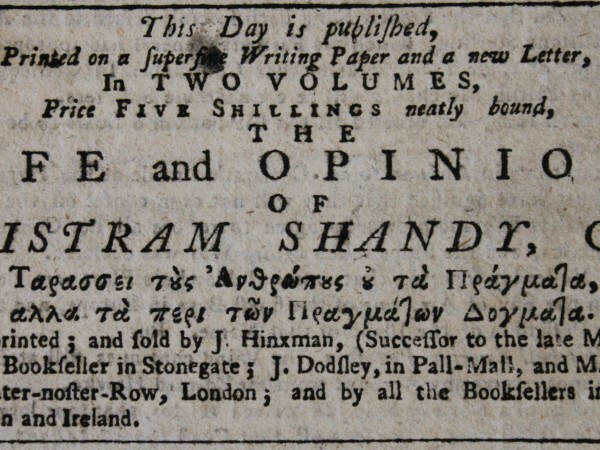 Between 1746 and 1756 Hildyard and Dodsley had been involved in collaborations on seven texts; Hinxman had worked with Dodsley on one other text in 1759 (William Weston’s The Safety and Perpetuity of the British State), and after the publication of Tristram Shandy they were to come together on a further nine titles in the years up to 1764, including John Hall-Stevenson’s Fables for Grown Gentlemen (1761). The York-London combination of Hinxman, Dodsley and Cooper was a sensible and experienced one for Sterne’s major venture into publishing. Elinor Camille-Wood and Patrick Wildgust’s discoveries are particularly well-timed in this tercentenary year.